A major new book by Paul Crawford, Brian Brown, Charley Baker, Victoria Tischler and Brian Abrams provides the world's first manifesto for the new field of health humanities. Health Humanities draws upon the multiple and expanding fields of enquiry that link health and social care disciplines with the arts and humanities. It aims to encourage innovation and novel cross-disciplinary explorations of how the arts and humanities can inform and transform healthcare, health and well-being. It calls for a much richer body of work that breaks out of limited applications of the arts and humanities to any specific healthcare discipline, as in the medical humanities, which to date has been largely preoccupied with training medical practitioners. As a more inclusive and applied field of activity with a fast-growing international community of researchers, health humanities looks to generate diverse and even radical approaches for creating healthier and more compassionate societies. This book aims to assist readers to consider how the arts and humanities can be applied more ambitiously in generating well-being. Book Details: Crawford, P., Brown, B., Baker, C., Tischler, V. & Abrams, B. 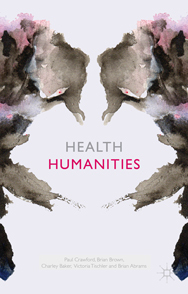 (2015) Health Humanities. Palgrave: London.